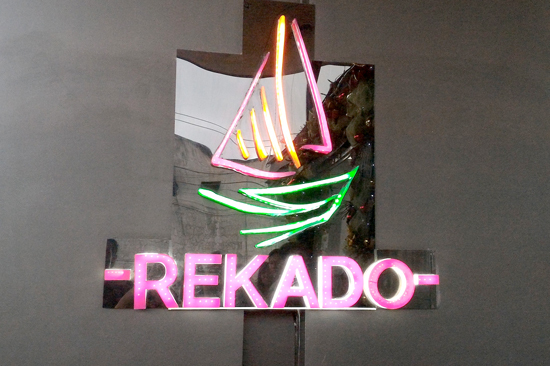 Located at 1050 Jacinto Extension here in Davao City is REKADO. 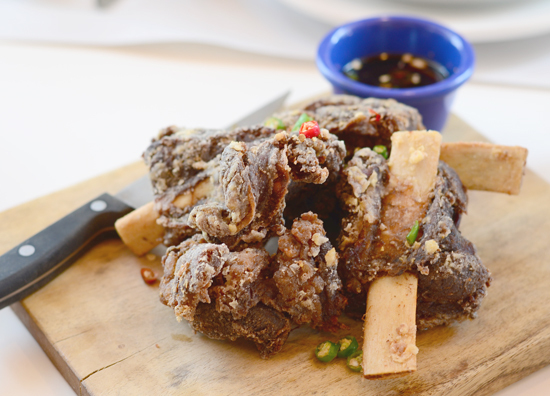 A charming and cozy Filipino comfort food restaurant also fondly called ‘the house of glass’. I’ve seen and heard a lot about this resto since it opened in summer and thought one day I should stop by and try. But for some reasons beyond me I always end up foregoing the plan. But on Saturday, I was more than privileged to join a bunch of awesome foodies to try and sample Rekado’s menu offering. The interior of the resto is as awesome as its exterior. It boasts modern rustic fixtures with neat sheer curtain panels allowing all-natural light to come in. The high ceiling of the dining hall make it look so spacious, comfy and blithe. On the whole, I simply love the place. But hey! More than a comfortable dining set-up is its equally delectable dishes thought your grandmother used to prepare back in your childhood. I was amazed to see that Rekado has an extensive list on their menu. If you’re a meat eater, a vegan, a non-pork eater or a seafood aficionado, there’s quite a sumptuous list waiting for you to pick. Just because the place looks expensive doesn't mean their list on the menu is too, you'd be surprised to know dishes are not only priced fairly, they're also served generously. Anyone craving for the taste and aroma of home can enjoy the food without a guilt of being broke. So what are we waiting for, join me as we dig in! Fresh Lumpia. I can hear you saying, that big? Yes, that big, a foot-long fresh lumpia. Rekado have all their dishes served in big portions, meant to be shared with family and friends. Gising-Gising. 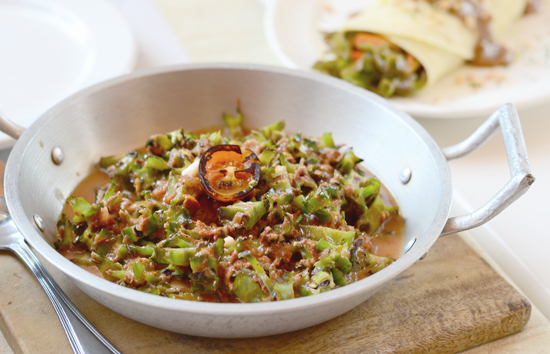 What’s a Filipino comfort food without veggies served from the song Bahay Kubo? This sigarilyas or winged bean in bagoong and coco milk is something you should try at Rekado. My subconscious foodie told me it’s super spicy (yeah, blame it to my lola, she always love to eat with her ears hot and smoking) but Rekado’s version is so palate-friendly, I love it to bits. Pinaputok na Bangus. 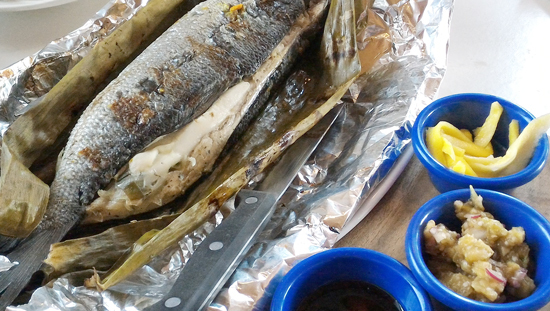 I’ve eaten quite a lot of this national fish of ours cooked in more ways than one in my lived life but I have to honest here, this is my first time eating steamed Bangus with buko (young coconut) meat in the inside. Tell you what? It’s more than sooo good! The buko took out the stench smell, complimented the greens and the spices you wouldn’t realize you’ve devoured it all. This is served with three side dishes; the burong manga, the ensaladang talong and the eternal Filipino default saw-sawan, tuyo. You shouldn’t miss a platter of this when in Rekado, must try! Baby Back Ribs. Meat eaters, fret not. There’s something hot and smoking for you too. 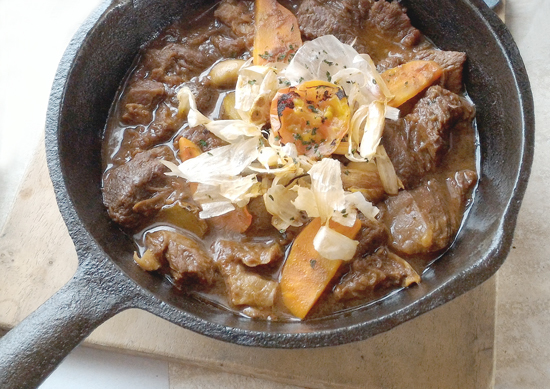 Braised for hours, this meat goodness comes to the table tender and tasty. Recommended pick! Crispy Beef Tadyang. With all frankness, thought this was gummy, but god of foods help me, it’s actually real good. Crispy on the outside and tender on the inside - thought that’s the best line to describe this dish. Finger lickin' ahhh! BTW, best eaten with bare hands! Crispy Pork Binagoongan. I’m a devout to anything pork binagoongan. Truth be told, pinapatulan ko lahat yan. Thought it’s always an experience to try eating other versions of cooking other than my granny’s all-pork-fat edition. 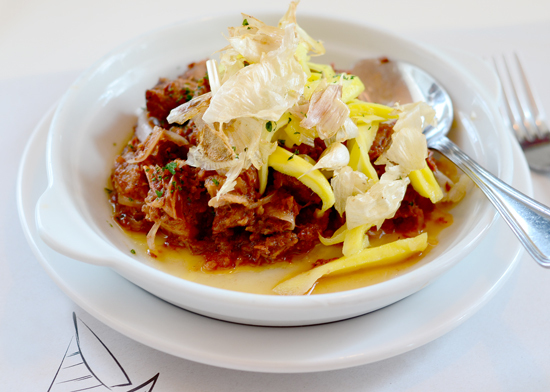 So, if you’re a pork binagoongan explorer, Rekado’s version is a dish to experience. Kalderobo. Kalderobo is a portmanteau of kaldereta and abodo. 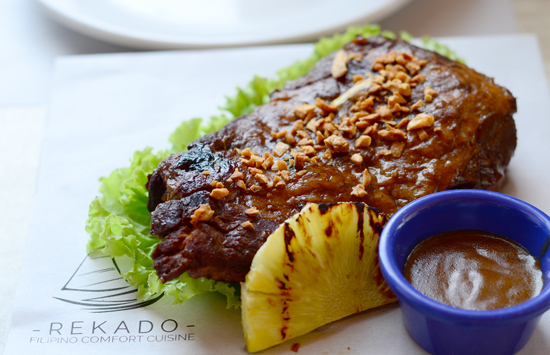 Popular Filipino food knowledge tells us these two typically have thick sauce and rich flavour, Rekado’s kalderobo is presented otherwise. This fusion comes in light, less grease and easy-going sauce. I like the idea that it’s served in an iron plate, keeps it warm a while longer. Superb! 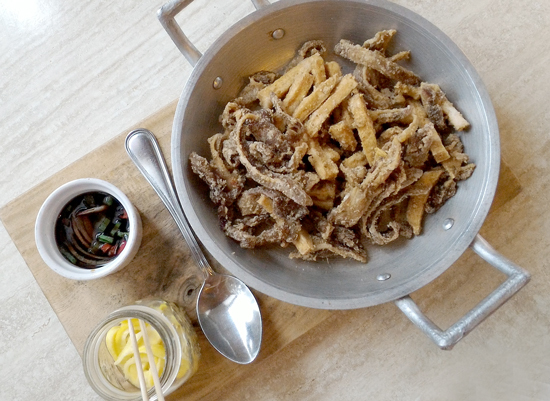 Crispy Tokwa't Tenga. This is so good paired with rice, but believe me when I say, best when paired with beer and a good company. Flavorful pick, so love it! Suman con Leche. 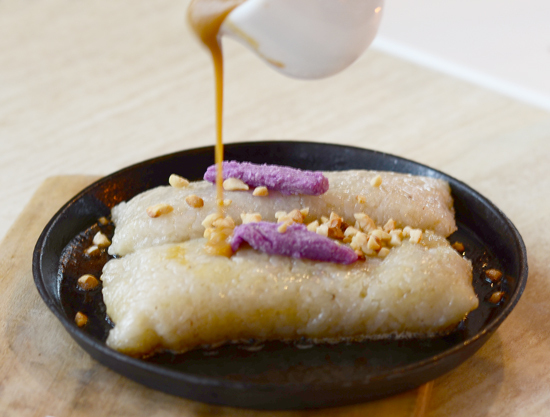 Sticky rice topped with ube butter, nuts and a generous helping of caramel sauce. This is a meal in itself. Thought this is the death of me. God, this is so good! Best pick for merienda cena. 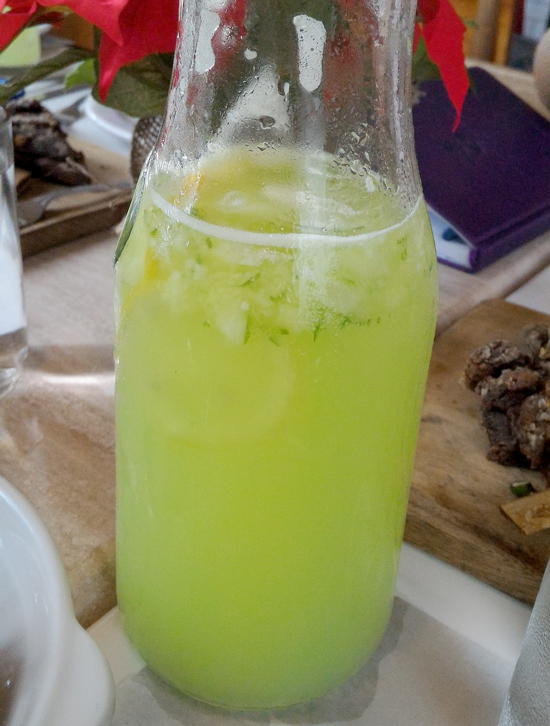 Cucumber Lemonade Carafe. Healthy, refreshing, so nice a color kids will love! Promise! 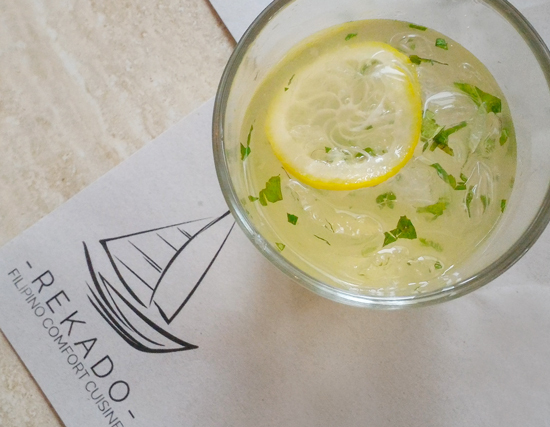 Rekado Mojito. 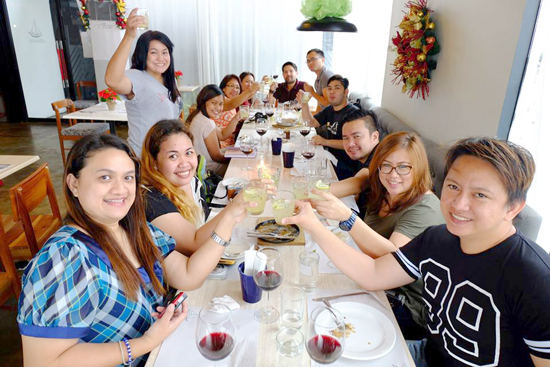 Rekado Davao don’t just serve sumptuous food of home, they too serve a variety of cocktails for your friends or co-workers to share and enjoy! And what's good food if not shared with good friends and have good laughs! Cheers! 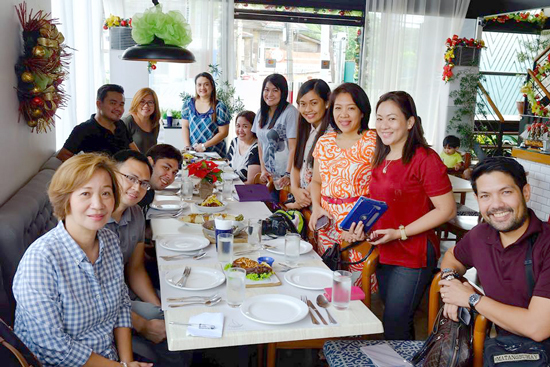 With our gracious hostess, Mrs. Lena Benedicto (front left) Thank you for having us. There’s nothing more comforting and satisfying than savouring the familiar aroma and flavours of home. Rekado Davao definitely hit it home! I am drooling ;looking at those. 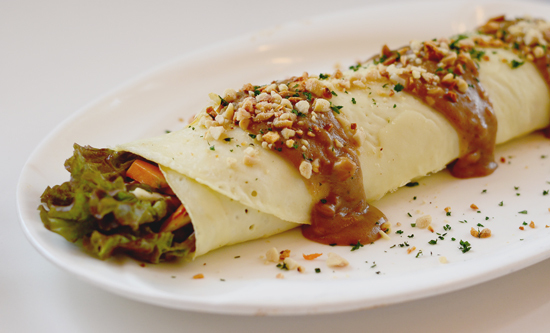 The fresh lumpia looks so delicious!